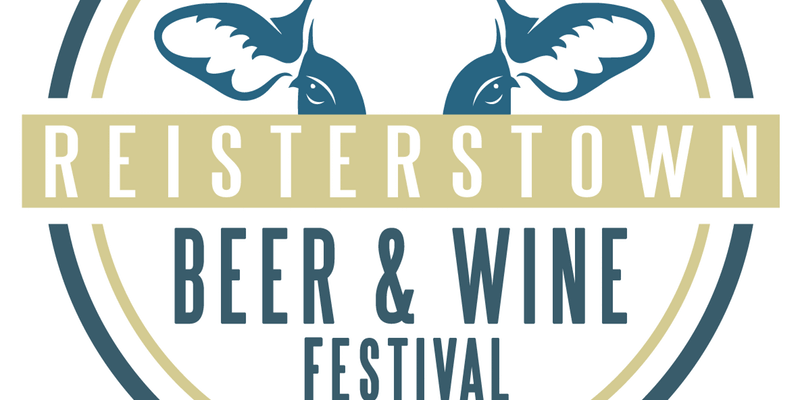 Do you Like Beer, Wine, Community Fun and Food? 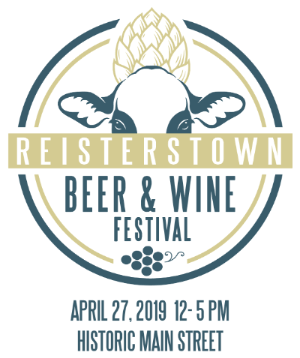 Come support the 1st Annual Reisterstown Beer and Wine Festival on April 27th! There will be local breweries, vineyards, distilleries, merchants, food vendors and most importantly your local community members having fun and enjoying Main Street, Reisterstown. Do you want to also support the Northwest Chamber? Are you interested in having a space at the event or being a sponsor? Contact Sally Shapiro-Gould or Kathleen Dorsey at 410-702-7073 or nw@northwestchamber.com. Northwest Chamber Members will receive a discounted vendor fee. Ruth’s Closet is a social enterprise of House of Ruth Maryland and profits support services and programs for victims of intimate partner violence and their children. Staff and volunteers are eager to assist you with what we like to call “guilt free shopping.” Any given day, you could find St. John, Akris, Diane Von Furstenberg, or Michael Kors, as well as Coach, Chico’s, Talbots, and Eileen Fisher. Follow Ruth’s Closet on Facebook for the most updated sales, promotions and more. Big Winter Blowout Sale happening now! 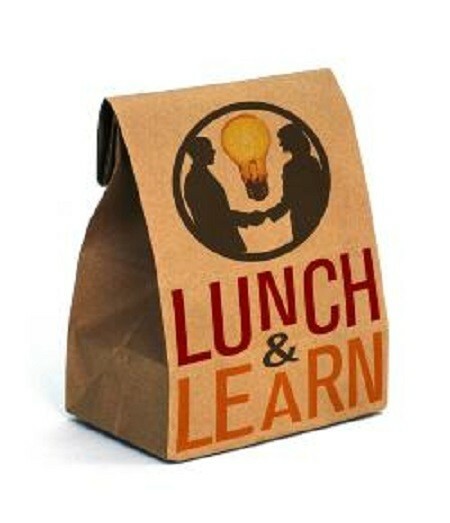 Network with 20-30 local business owners and professionals while enjoying a FREE lunch. This monthly networking event normally sells out- so save your seat now. will be speaking to attendees about financial planning and business. We thank Primerica – Owings Mills for hosting our February Lunch & Learn! 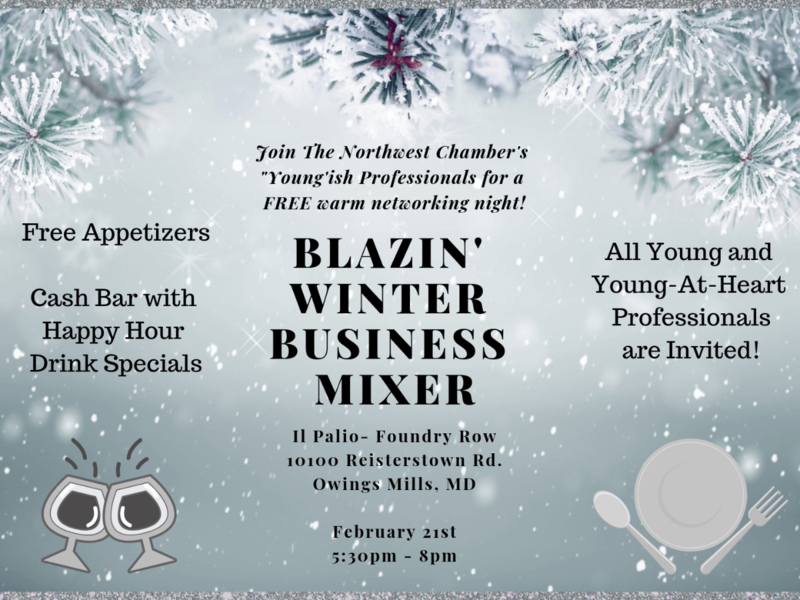 Our popular Young’ish Committee’s FREE Winter Business Mixer brings together local business professionals for free appetizers and more. Cash bar will be available with Happy Hour special pricing! If you are a young professional, or young at heart, don’t miss out on this free networking event. 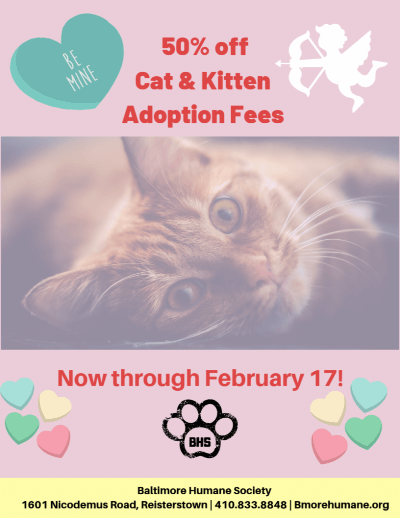 The Baltimore Humane Society is offering 50% off cat and kitten adoptions now through February 17th! Be sure to stop in and take advantage of this discount. 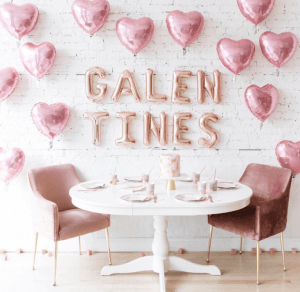 We’re having a Galentine’s Party! Call 443-881-8121 or go to Kacadas.com to register. This month is Valentine’s Day! Let’s celebrate with a Yappy Hour! 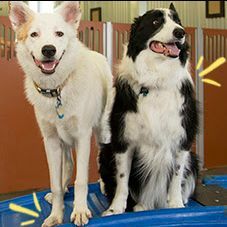 Join us for pup-tinis and a snack on February 14th at 5:30-6:30 at camp! See you there! 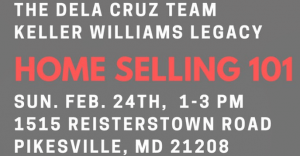 Join the dela Cruz Team for a FREE comprehensive workshop to prepare to sell your home! You will get a complete home selling overview and learn their valuable home selling strategies which will get the sale of your home done fast, for top dollar, and with the least hassle. Do I need to sell before I buy or buy before I sell? What do I need to do to get my home ready to go on the market? What can I skip? Does staging really matter? What does it cost? The entrance is in the back of the Wells Fargo building. Drinks and light refreshments provided. 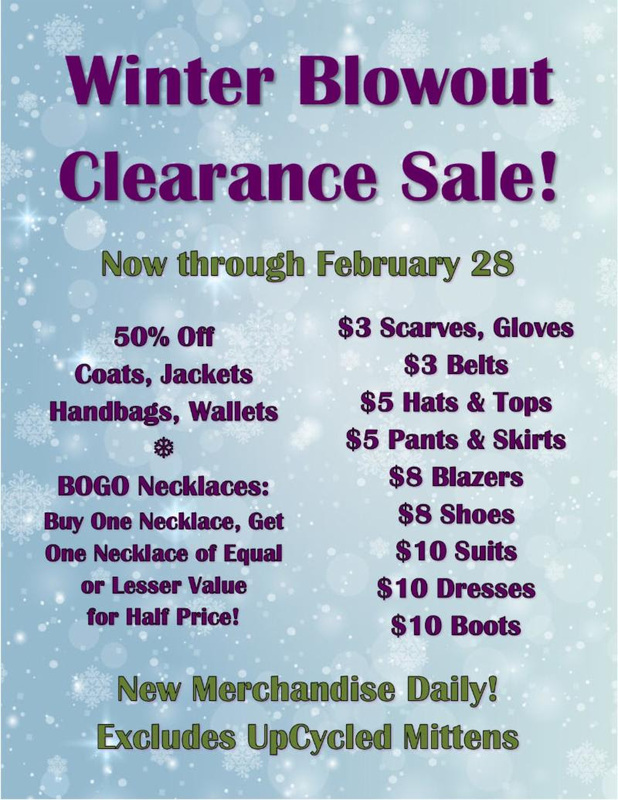 The Winter Blowout Clearance Sale runs now through February 28th, and includes 50% off jackets, coats and handbags, buy one get one necklaces, and discounted winter apparel such as scarves, gloves and more! See the flyer below for full details. Donations: clean and in excellent condition, of women’s clothing, footwear, outerwear, accessories, and jewelry, are accepted Tuesdays and Thursdays during business hours. Clothing items on hangers only, limit 20 items. Thank you for donating Tuesdays and Thursdays only during business hours.